Yesterday night I finished this top. It is done without pattern inspired by the angel wings pinafore (for a baby girl). I wrote while working. Today is the day! Here is the pattern. Since nobody took a proper picture of me, only the pattern today. This is my first garment pattern. So if you find a mistake or something is not understandable, please contact. I’d like to see your results. Please post pictures on Ravelry. Would be so nice! Weave cord trough the top right under your breast and tie it to give it a nice shape. Well that is super freakin’ cute! And the color looks great on you! This is completely adorable in every way…the color, the feminine shape and the lacy stitch. PLEASE post the pattern on Ravelry or here when you can!!!! Thanks, Michelle! The pattern is now available here. Have fun crocheting! Well, I guess it’s back to the yarn store! I should get some real “work” done today, but I think I may be distracted! Thanks so much for this! I will post it on Ravelry when complete. Feel free to do so. Your page looks great, nice pictures! Love it, is their a way to adjust it to an x-small or small, thanks, and that color looks stunning on you! Can you calculate a gauge? How many stitches per inch? And then the next step would be give us a final measurement size– how many inches wide at the bust and how many inches long. That might help us adjust. It really is a LOVELY top. Good point! I added it. By the way, my bust circumference is 44 inches, so the top with its 47 inches is rather loose on me, but it’s okay. 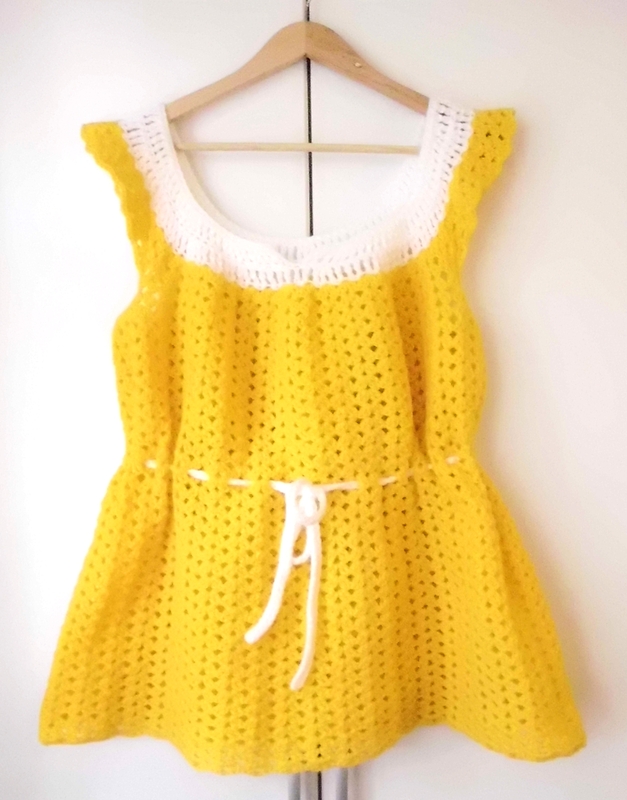 This is by far the cutest crochet top pattern I have found!! Love it! BEAUTIFUL!!!! SO GLAD YOU SHARED THE PATTERN I BELIEVE I MAY MAKE MYSELF ONE!!!!!!! I love that you made a plus size CUTE pattern!! In row 4 ” *(2 dc, ch 2, 2 dc), skip one st* repeat til end (72 shells).” Does that mean you put the (2 dc, ch 2, 2 dc) all in one stitch? I’m haviNg an issue after completing the section in white…am I turning and working the original chain again or am I to fasten off? I thought I was supposed to start at the end of last trc? Yep, you are thinking the right way. 😉 The original chain should not be joined. So there is only one consistent side and this is where you stopped with white. Good luck and have fun while making it! awesome shirt. i plan on starting this project right now but im wondering about the arm holes. are they already included into the pattern above or do i need to make my own straps/arm holes? nevermind i get it now. What an adorable top! And perfect size too! I will be trying to make this for myself soon. I’d love to see pictures when you’re done with! Have fun crocheting. Nice top I am making on white and hot pink . I will like to ask you a question do you wear the top alone or with another of fabric underneath. Just asking because the shell pattern makes a lot of holes. But I love the top planning on doing the black and green one too. Thanks! 🙂 Hope you like your top. I always wear it with a tank top underneath. The white part is joined later on to form a little open triangle. Maybe you can see it on one of the pictures? The yellow yarn is worked around the white one, no seam. You can use foundation single crochet if you want to, even if you leave it open like the pattern calls for. The arm holes are worked by leaving some stitchen of round before unworked. Hope this helps! Happy crocheting! Thanks for answering so fast. As soon as have finished will post pictures. Blessings. Looking forward to seeing your top!! Have lots of fun! Hi, beginner crocheter, but I’ve crochet some intermediate projects. 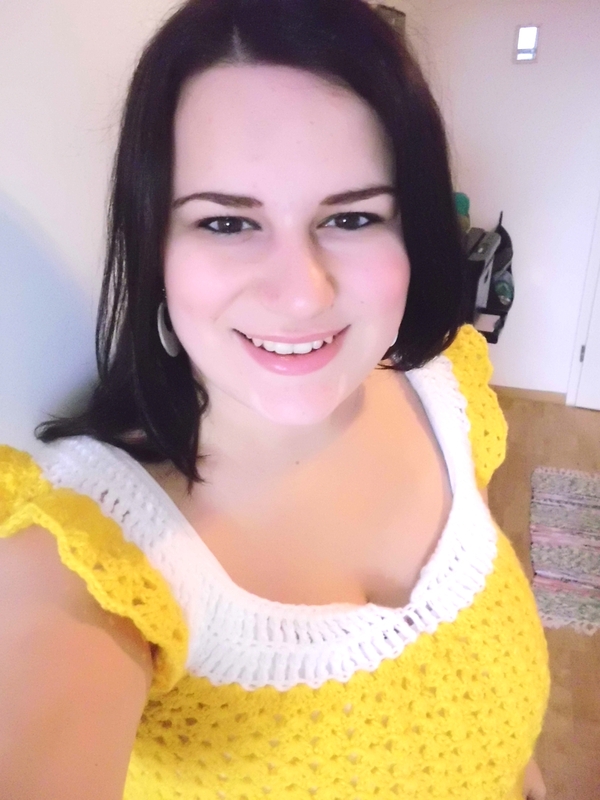 I love this top!…I’ve never crochet a top before…Do you have any suggestions on alternative amt of stitching to make this top a large size.